Fall Bulk Flower Pack is a unique mix of fall flowers. These flower crops were planted specifically to bloom during the fall season. 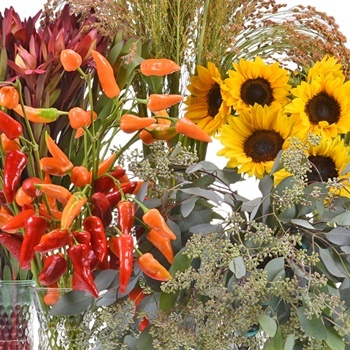 This flower pack includes 10 bunches of the following mix: Chili Peppers, Seeded Eucalyptus, Sunflowers, Safari Sunset, and Broomcorn. 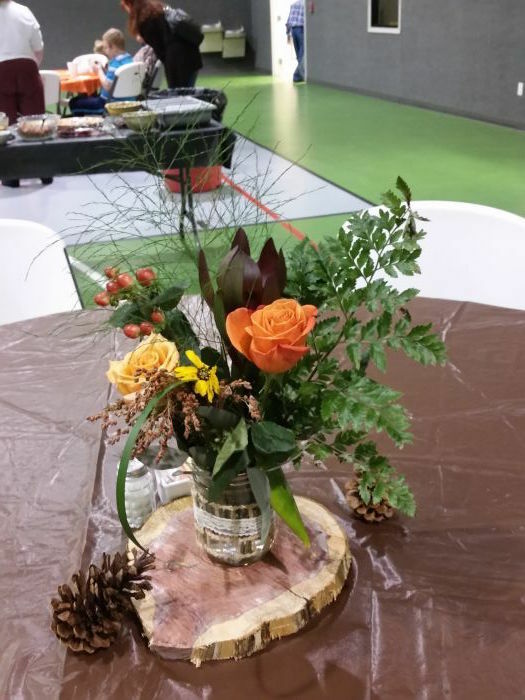 Decorate your wedding, family event or school function with the beautiful fall flowers. These flower packs are California grown and shipping is included in the price for a limited time! 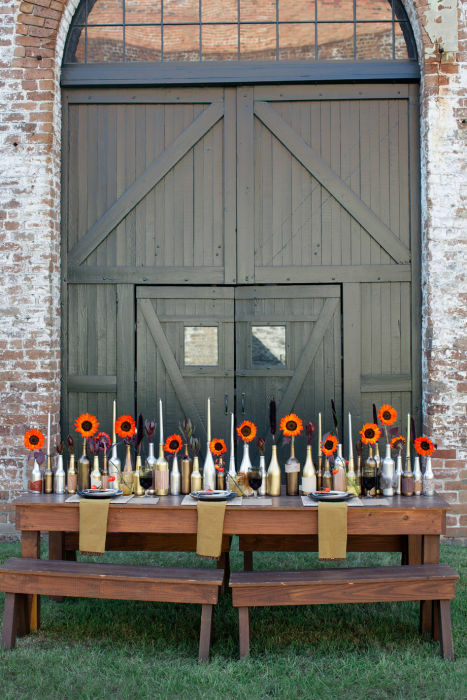 For Inspiration, Check out this Blog Post on Fall Tablescapes. 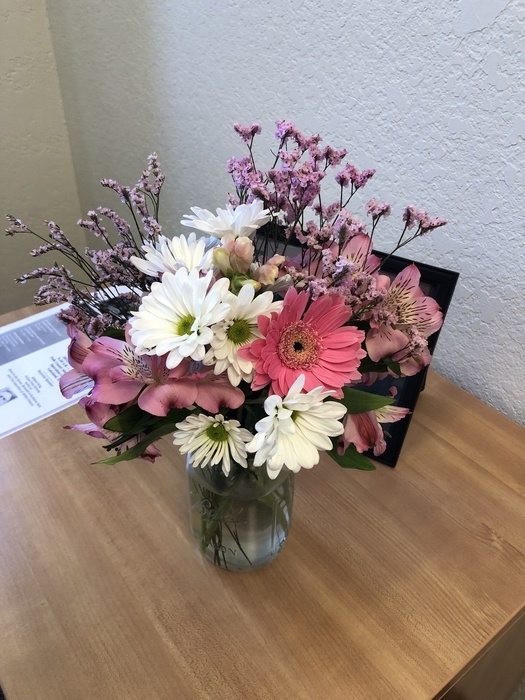 This Mixed Flower Box is available September through November. 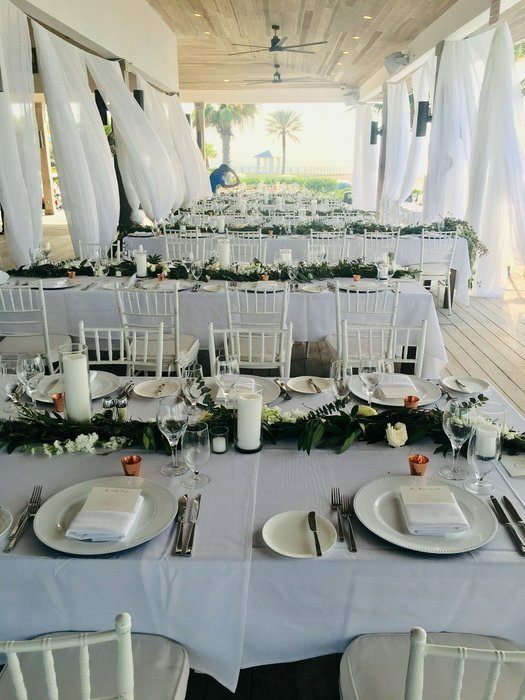 This flower is seasonal and the exact dates may vary. This Flower Pack includes 10 grower bunches with the following mix: 2 bunches of Chili Peppers, 2 bunches of Seeded Eucalyptus, 2 bunches of Broomcorn, 2 bunches of Sunflowers, 2 bunches of Safari Sunset. Chili Peppers grower bunches are 10 stem bunches and a minimum of 10 inches length. Each stem has a minimum of 10 Chili Peppers. All Chili Peppers will be mixed of fire engine red and green jalapeno. Please note these peppers are NOT recommended for personal consumption. Seeded Eucalyptus grower bunches are 5 to 8 stems per bunches and measure 12 inches in length. Broomcorn grower bunches are 10 stem bunches and measures 24 inches in length. Sunflowers grower bunches are 5 stem bunches and measure 30 inches in length. The Sunflower is the yellow sunflower with the brown center. 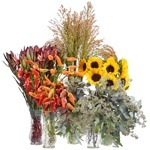 Safari Sunset grower bunches are 10 stem bunches and measure 24 inches in length.